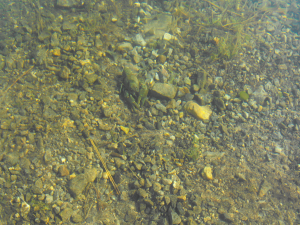 Observation - FRESHWATER CRAYFISH - UK and Ireland. Description: Lobster like crustacaen about 40-50mm long ,colour camoflaged it well as it turned stones in search of food in shallows of an artificial lake with a marlly bottom. Lobster like crustacaen about 40-50mm long ,colour camoflaged it well as it turned stones in search of food in shallows of an artificial lake with a marlly bottom.